The idea for this illustration was inspired by my years of reading Osprey Publishing amazing 'Men at Arms' books and "Elite' etc. 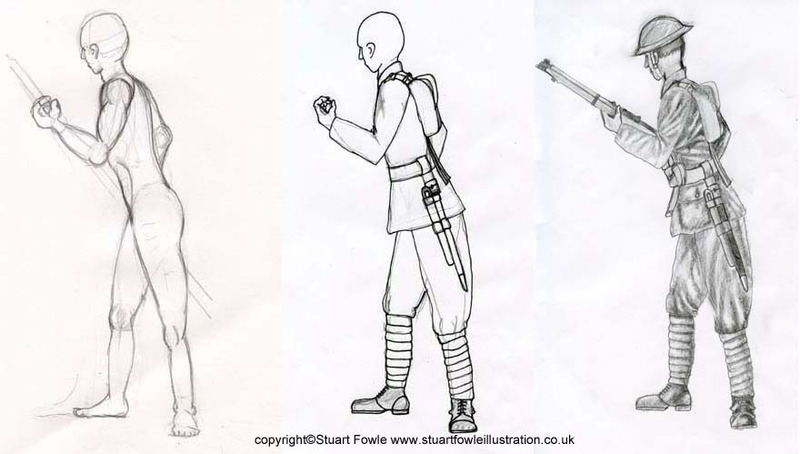 The illustrations would have a selection of soldiers in a setting. 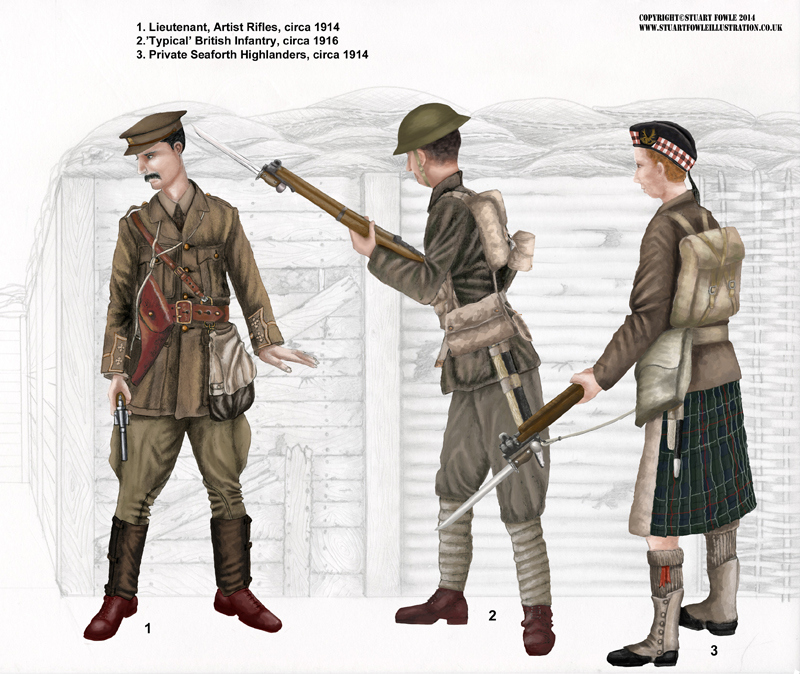 So with the Centenary of WW1 next year (2014), I decided to do something similar, by setting 3 British soldiers in a trench system. However I also wanted to show different trench construction styles, so have included that. Once I have got all the pencl work done, I will start on colouring them in Photoshop Elements. And then combine all the images in to one picture. Initial ideas skecthed out. Started out with 2 soldiers, but then decided to go with 3. Also decided to not have the firing step, so the soldiers will eventually be set against the back wall of the trench. Image 3 - Trench in detail, showing one section made from planks of wood, another section made from corrigated metal and the last section from wattle. First soldier to be done was the Officer, natuarally leading from the front. You can see how the idea developed and what changes were made as it progressed. Soldier number 1, was then sketched out and created. He is currently missing his bayonet, and may need some tweaking. Soldier nuber 2 has been started. 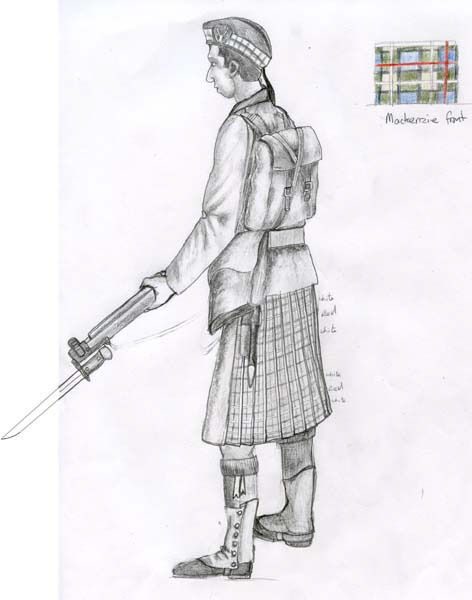 To add a bit of interest, this one will be a soldier from one of the Scottish Regiments. Soldier 3 sketched out and ready for some colour. He represents a Scotish soldier from the Seaforth Highlanders. Found some time to sit down and start working on this one again. I'm finding my 'work flow', of creating the original images in pencil, complete with rendering, and then scanning in to Photoshop Elements for colouring, is working really well for me. 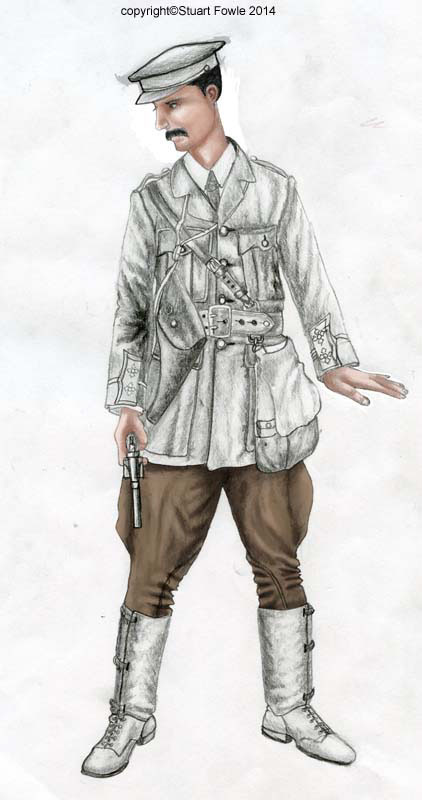 As you can see, Work In Progress of the British Officer, he's looking quite good at the moment. Just a quick update on how I'm progressing with this project. I'm still working on the Officer figure, but hopefully not much more to do on him. 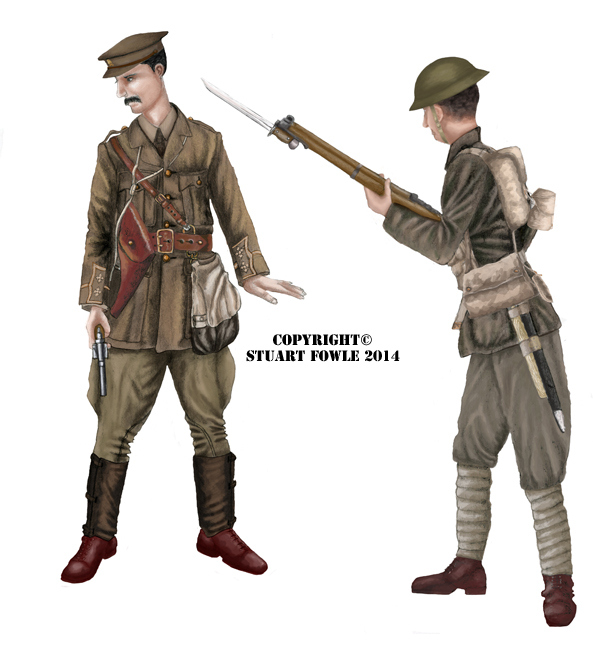 Officer completed (Lieutenant from the 'Artist Rifles'), 1st soldier started. 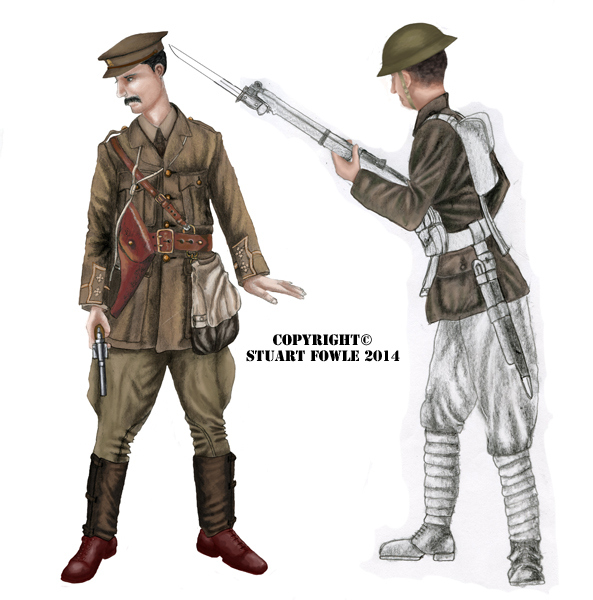 Soldier 1 almost done, will tweak after I've let it sit for a while, and add any extra's I feel that it will need. Finally completed this one. Finished it in the style of Osprey Publishing 'Men-at-Arms' series. 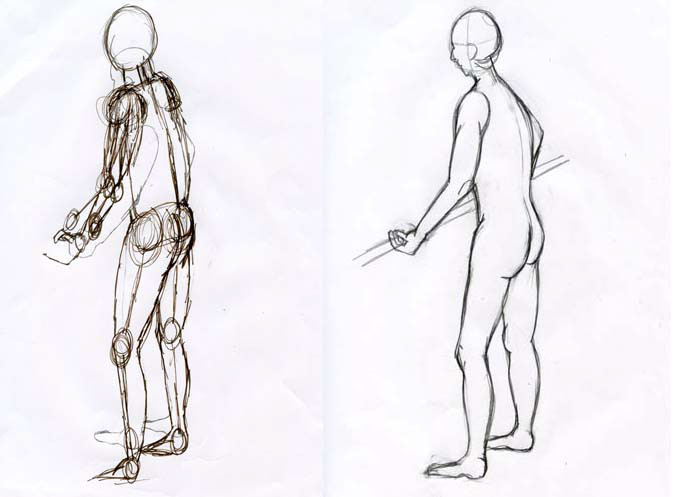 3 figures from the same era, set in a similar situation. I also added some trench details, in this case, 3 different styles of reinforcing the trench walls (wood, corrugated metal and wattle).